This is a quick update on the status of Facebook’s issues. I could have written several such posts as the weeks have gone by since I posted that I quit FB on January 7, but this will do. 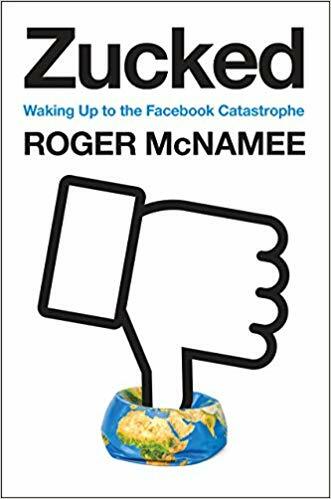 I’m bothered that this isn’t in the news more about healthcare, but it is in the news for high tech and investors, especially since the Feb. 5 publication of the new book Zucked, by Roger McNamee, who was an early advisor to the company and continues to be a big fan. It might sound like a tell-all scandal book (and “catastrophe” in the subtitle is certainly scandally) but I’m listening to it on audio and the book itself is not, at least so far. The guy believes that Zuck (whom he personally coached) and COO Sheryl Sandberg (whom he recruited to join FB long ago) have just gone too far in their belief that they’re not responsible for what anyone does with their software. It’s been discovered that they’ve been paying teens to install software called “Facebook Research” on their phones. It actually includes a so-called “root certificate,” which (when the teen clicks “yes”) gives the software unlimited permission to snoop anywhere, in any app, look at selfies and other photos, etc etc. Oh, and in some cases it was distributed without FB’s name on the app. I could go on, but I just want you to know (a) there are real questions about whether “we’re not responsible” is viable excuse (or even credible), and (b) we keep discovering stuff they did that can’t possibly be explained that way – e.g. the covert “root certificate,” as well as the way they coped with the abuse-group hackers (in my previous post) by immediately destroying all the evidence. Not hunting down the perps – burning the whole thing down! Oh, and there’s the record multi-billion-dollar fine the FTC is negotiating with FB, which from FB’s point of view will gratefully put an end to the FTC’s investigations – just as the cigarette industry was happy to settle its investigations, so investors could move forward feeling safe. I have to say that being off Facebook has not been easy. I miss automatically hearing what friends are up to, and I miss being able to share fun or interesting things with a huge audience with a few clicks. One huge ethical problem with that approach is that the resulting profile can then be used to, for instance, target “women who’ve expressed interest in pregnancy” – even if they didn’t say anything of the sort on Facebook. As a final note, another new book, out last month, is Surveillance Capitalism, by Harvard sociologist Shoshana Zuboff. I’m reading that too – it’s nerdier than most people would enjoy, but although it’s a bit ranty in places, she makes a solid case that the players in our world who have tons of data about us have a major advantage that will be increasingly important. I haven’t stopped using my computers or iPhone (heh, obviously) but it adds to the overall question of what’s going on. By being off Facebook I’ve freed up a lot of time, which I’ve been using on LinkedIn, which turns out to be good for my business. And for the social connection aspect, I’ve decided to try getting more active on this blog, too. p.s. If you like, have a look at the FB article in The Atlantic a month ago, Facebook Users Still Don’t Know How Facebook Works. Not even its core business practices. But don’t feel obligated… that’s why this is a PS! Nice post. I would dearly love to leave Facebook, but currently I am working with five organizations, ranging from a local Nordic ski club, through our city and county Democrat Party, my college class, and a bystander intervention program that require Facebook participation. I suppose I could just stop using and looking at my personal page. At any rate, I look forward to interacting here. MUCH better quality of content. I long ago decided that anything I put out there on social media — and perhaps other media venues — was likely to be slurped up by others and used as suited them. So I have tried to be somewhat careful. Dave, what makes you think that LinkedIn isn’t doing (or capable of doing, or poised to do) the same thing FB is? Or Amazon? Or…? And going a bit further with my question… Is there any way for people to engage with the new, digital world without becoming a data point to be slurped up by someone else? How about the older-style email listservs? Are they immune to data slurping? I appreciate your posts on this…. They give me more info about an area of concern I have not been following closely. Another question…. Is there a way that end-users like us could throw a monkey wrench into FB data slurping and manipulation tactics? Is there power in, potentially, millions or billions of single users behaving in some way that would confuse or nullify the data slurping benefits of what these others gain from us? In other words, could we create so much noise for the slurpers that the data they acquired would be more or less meaningless? And could we do so in a way that would not compromise our own ability to find usefulness in social media? Nice post. We’re very much on the same page about Facebook and Zuckerberg. The lack of corporate and personal accountability is stunning and reprehensible. From the research I’ve seen, your view of Facebook is widely held. Yet most people also feel powerless to actually do anything. Peter, your words express how a lot of folks feel. You can leave FB, but you can’t take your network with you. So most stay. I’ve also ordered Surveillance Capitalism…look forward to your thoughts. One action item for all of us is to pay attention to the various privacy bills being submitted in Congress this year. We need to set legal boundaries to begin to reign in the abuses. Facebook is big and bad, but it is also a red herring that misdirects nearly all reporting on surveillance capitalism away from the larger systematic problem, which is surveillance-based advertising in general. This business has less in common with old fashioned brand advertising than it does with the junk mail business from which its methods, purposes and excuses have been borrowed. I’ve written extensively about this (see http://j.mp/adbwars), and I’m working pretty much alone on that beat, since surveillance-based advertising, known in the business as adtech, funds nearly all commercial online publishing. Across the board, commercial publishing onine has handed all of its non-subscription income production over to adtech intermediators, and is no less guilty of putting trackers in your browser than is Facebook—and they’re a helluva lot less transparent about it. This topic is a huge third rail, and approximately nobody being paid by adtech wants to touch it. Case in point: when I ask reporters who publish deep and knowing investigations into wrongdoings by Facebook or Google why they don’t do the same to their own employers, they go silent. This happed with Techcrunch a couple days ago, and with the New York Times repeatedly. BTW, since you’ve ordered Surveillance Capitalism (which features a blurb by yours truly on the back cover of the flyleaf), also grab a copy of Re-engineering Humanity, by Brett Frischmann and Evan Selinger, which I wrote about last summer, here: https://www.linuxjournal.com/content/engineers-vs-re-engineering . In that piece I asked the geeks who read Linux Journal to help develop technical solutions that start with you and me. And I heard crickets again. It’s a hard problem, and don’t count on governments to fix it either. So far both the GDPR in Europe and California’s new privacy law have done nothing to equip you and me with better privacy tech. But they have caused a bull market in legal services, mostly for businesses working to obey the letter but not the spirit of those laws—and succeeding at exactly that. Exhibit A: “cookie notices” on websites that misleadingly coerce readers into accepting exactly the kind of surveillance the laws were made to stop. Boy, Doc, it’s so good to see you checking in on this. I for one am interested in learning how to investigate what you encouraged those reporters to do. Is it clear how they’d explore, other than just asking their bosses? btw, will you-all be doing a 20th anniversary edition of Cluetrain? This whole area of surveillance data as an approach to revenue puts a massively different light on what you wrote about back then. For those who don’t know, Doc is a legendary voice of the future. He co-authored the then-astounding / now-obvious book Cluetrain Manifesto in 1999, which declared “Markets are [now] conversations,” which at the time was not obvious but sure is today. But as with Zuboff’s 1980s book above, it’s only obvious in hindsight. btw, I don’t know if I’d agree that FB misdirects attention – maybe, but I’m not sure. My experience with deep important issues like this has been that it’s hard to get people (the general public, “consumers,” etc) to detect that something’s off, if there’s not obvious signs of it, which in this case may be the useful thing about the specific case of FB.